The conference will take place at the ENS de Lyon, 15 Parvis René Descartes, 69007 Lyon. The Ecole Normale Supérieure de Lyon is sit­u­ated in the 7th arrondisse­ment of Lyon (the Gerland area), at the corner of Avenue Jean-Jaurès and Avenue Debourg. 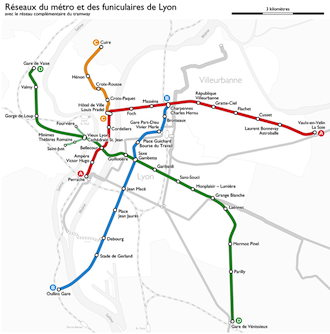 It is next to Debourg sta­tion on line B of the Lyon metro. By metro : From the city centre, take line B in the direction of Stade de Gerland/Gare d'Oullins, getting off at Debourg station. By bicycle : There is a Velo’v stand (city bicycle scheme) just outside the ENS, and in 340 locations throughout Lyon. Cycles can be borrowed using a French bank card; the first half hour is free. By train : Lyon’s two main-line railway stations are Part-Dieu (recommended) and Perrache. From Part-Dieu, take line B of the metro, as above. From Perrache, follow signs to bus stops, take bus number 32 towards Etats-Unis, and get off at Gerland-Debourg. By air : Flights arrive at Lyon St-Exupéry airport, from which the city centre can be reached either by taxi (around 30 minutes), or by the Rhône Express Tram, which runs every fifteen minutes. 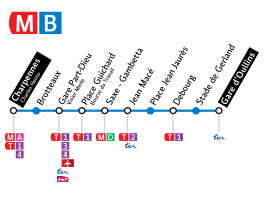 Take the tram to Part-Dieu station and then take line B of the metro, as above.